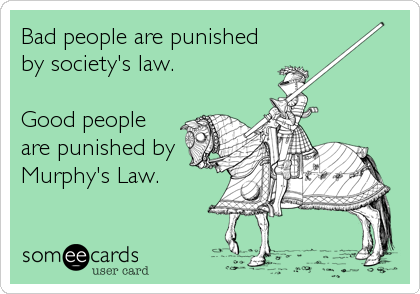 When everything is going happily and smoothly, you can expect Murphy's law to suddenly come into effect at the worst possible moment. Anything that can go wrong will go wrong. Our honeymoon was breathtaking. Full of love, full of fun and full of action. Knowing that having less than an hour between flights was quite risky, we took precautionary measures by travelling only with carry-on luggage and by downloading our boarding passes on our phones for the flight leaving for Dallas. So... what can go wrong? A lot of things! Murphy 1 - Newlyweds 0: Our first flight was delayed-- suddenly, the 55 minutes ticked down to 50 minutes... then 45 minutes.. then 40 minutes. Murphy 3 - Newlyweds 0: When it was finally time, we grabbed our carry-on luggage and ran out like contestants on The Amazing Race. As we were running and looking for our gate, we came across another one of Murphy's tricks: the gate of our next flight (that was in about 30 minutes) was at another terminal. What does that mean? We had to go through security AGAIN! As we were approaching security, we met HIM! We could hear his high-pitched and nasal voice from several meters away. He was a short and slim middle-aged man likely of Filipino origin. He was wearing an ill-fitted burgundy suit jacket, dark pants with a big walky-talky hanging by the side and big, old-fashioned glasses with a silver frame. He was the bodily equivalent of Murphy's law; he was EMMANUEL! Murphy/Emmanuel 4 - Newlyweds 0: Every once in a while, you meet someone whose sole purpose in life seems to be to ruin yours. Emmanuel's job was to check travelers' tickets and to ensure that their carry-on luggage were of appropriate size before going through security. We had been on multiple flights with the same carry-on luggage and nobody had a problem with the size... nobody except, inevitably, Emmanuel. Yes, our bags were somewhat big (especially with the beautiful beach towels I got from Vegas!) but we were trying to explain to him that we had been on other flights with these bags before and that our next flight was to leave soon. He did not care. His high pitched voice got even higher as he told us that he was doing his job and that we had to check our bags in at the counter. As we arrived at the counter, the woman behind it told us that it is too late to check anything in for our flight. We ran back to Emmanuel and told him that he had to let us through with our luggage because we could not check our bags in. He pointed at the small compartment in which our suitcases were supposed to fit and kept repeating in his continuously-elevating voice "I have to do my job! There are cameras everywhere. I will call security if you try to pass!". He was clutching on to his walky-talky when he was mentioning the word "security". Mr. A and I had now reached levels of stress that we did not know existed. Some *beep* words were uttered as we opened our suitcases and started emptying its contents and stuffing whatever we could in my purse and wrapping other things in my beautiful beach towels. We zipped up our bags, made it fit in the compartment and uttered a few more not-so-classy choice words to Emmanuel as we made our way to the next step. Murphy 4 - Newlyweds 1 (YES! ): Luckily, after hearing us and seeing our stress, many kind travelers let us pass before them in the queue. Finally, our streak of bad luck seemed to be ending. Just a few more steps before we could be on our plane. Murphy 5 - Newlyweds 1: Spoke too soon. Murphy played another one of his cards when it was time to show our boarding passes. As mentioned, we only had electronic boarding passes on our phones and (surprise surprise! ), the scanner was not reading them. We spent another 5-6 minutes in front of the absent-minded agents who were looking at us in a very dull and unimpressed way. It seemed like they did not have an ounce of sympathy or urgency in them. Finally, with the help of some very kind fellow travelers, we zapped our boarding passes. We zoomed through the following security steps and, with our shoes still halfway on, it was time to sprint. I felt like we were running at such a speed that could put Usain Bolt to shame. We arrived at the gate mere minutes before the plane took off. Still somewhat trembling, sweating and holding giant, stuffed beach towels, we made it to our seats while telling eachother "Never again!" 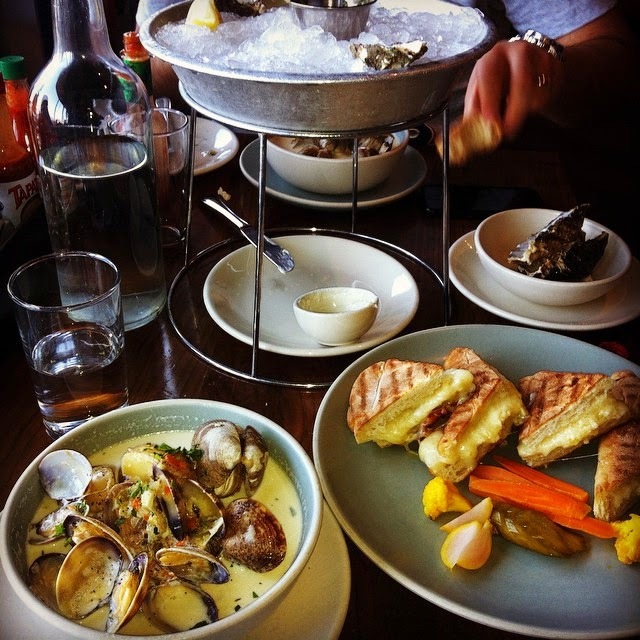 Our first meal on our honeymoon was lunch at the Hog Island Oyster Company in the Ferry building. Fresh oysters, warm clam chowder and comforting grilled cheese. The grilled cheese was completely different than the others I have tasted. The bread had a delicious crunch and the gooey center was filled with melted, sharp cheesy goodness. Perfect meal for a windy and chilly day. 1. Butter one side of each slice of bread. Place 4 slices (butter side down) on a board and spread the fromage blanc on the plain side. Top each of these with the Gruyère, Cheddar and Havarti cheeses. 2. Heat a large skillet for about 2 minutes. place 1 or 2 sandwiches in the pan, cover and cook for 3-4 minutes (until golden brown). Turn the sandwiches and press on them firmly with a spatula. Cook for another 3-4 minutes. 3. Remove from the pan and let cool for a few minutes (if you can!). Slice diagonally and serve.